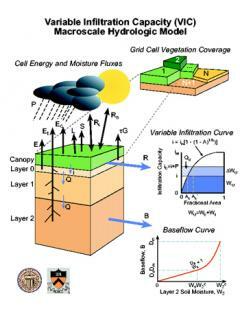 The model parameters used to simulate the hydrologic fluxes and states in the two data above sets are available hereon the Livneh Research Group server. These parameters represent the culmination of numerous calibration efforts including those conducted by Maurer et al. (2002), Zhu et al. (2007) at 1/8° and Tang et al. (2012) at 1/16°, as well as default parameters from the NLDAS initiative for other regions. Information on the VIC model is available here on the University of Washington page. *Note: Since soil-parameter calibrations were done on a basin-by-basin basis, certain parameters are discontinuous across basin boundaries. Livneh B., E.A. Rosenberg, C. Lin, B. Nijssen, V. Mishra, K.M. Andreadis, E.P. Maurer, and D.P. Lettenmaier, 2013: A Long-Term Hydrologically Based Dataset of Land Surface Fluxes and States for the Conterminous United States: Update and Extensions, Journal of Climate, 26, 9384–9392. Maurer E. P., A.W. Wood, J.C. Adam, D.P. Lettenmaier, and B. Nijssen, 2002: A Long-Term Hydrologically Based Dataset of Land Surface Fluxes and States for the Conterminous United States*. Journal of Climate, 15, 3237–3251. Zhu, C., T. Cavazos, and D.P. Lettenmaier, 2007: Role of antecedent land surface conditions in warm season precipitation over northwestern Mexico.Journal of climate, 20(9), 1774-1791. Tang, Q., E.R. Vivoni, F. Muñoz-Arriola, and D.P. Lettenmaier, 2012: Predictability of evapotranspiration patterns using remotely sensed vegetation dynamics during the North American monsoon. Journal of Hydrometeorology,13(1), 103-121.